Possibly the most sacred and important building of the empire of the Tahuantinsuyo , Coricancha was the name given to the Inca Temple of the Sun. In times of conquest, the temple was destroyed and looted. 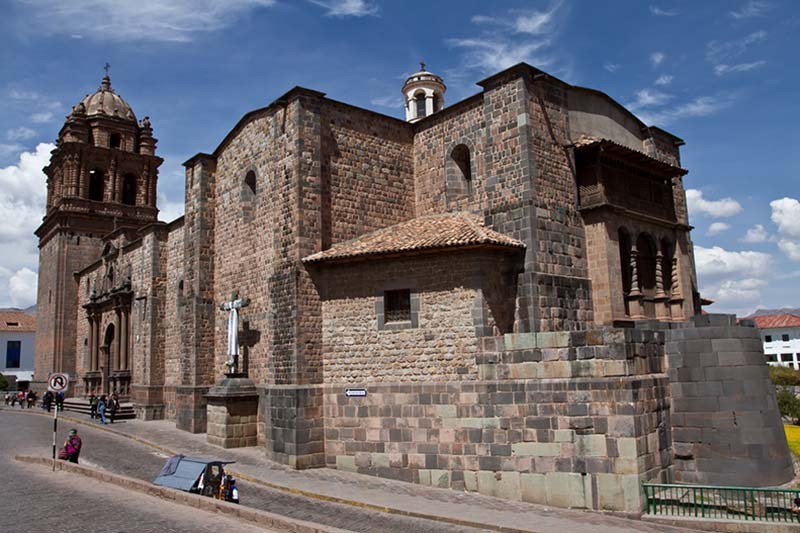 At present the colonial structure of the Church and Convent of Santo Domingo, uses as base the foundations and original walls of the Inca Temple Coricancha. The Coricancha Temple is located at the intersection of Av. El Sol and Santo Domingo Street, 2 blocks from the Main Square of the Cusco in Peru, and can be visited from Monday to Saturday from 8 am to 5 pm. The Temple of Qoricancha is the best prior to what you will see in Machu Picchu . The Coricancha, Qoricancha or Koricancha , means something like “gold enclosure”, and was a very important Inca construction for this civilization, was built in the capital of the empire of the Incas and as its name indicates, was full of gold. 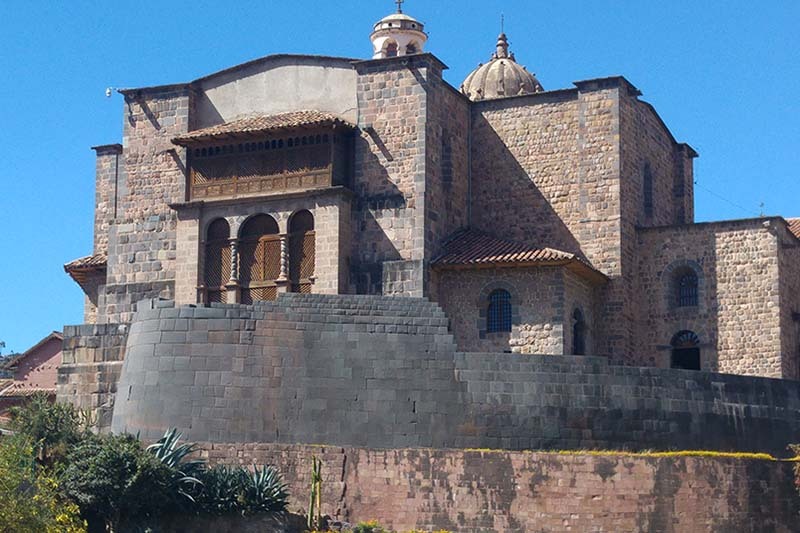 This Inca complex was built on a natural hill in the sacred city of Cusco, between the rivers Shapy, Tullumayo and Huatanay. As it is known, it was built during the Inca Huiracoha government, back in the year 1,200 AD. (The dates of Huiracocha’s government are debated), it is said that it was embellished by the Inca Pachacútec (ruled between 1438 and 1471). The layout of the archaeological site, simulating a sun with rays that shone in all directions, these were the ceques (lines), 41 physical and cosmic roads, which would lead to more than 320 sites sacred to the Inca civilization. It is known that the Inca route of the city of Cusco was made in such a way that it represented a puma (or jaguar), and Coricancha is in the queue. The second most important sacred place of the city Puma was Sacsayhuamán, that is in the head. The fine walls of the Coricancha, express the great level of engineering that reached the Incas, these walls were built from large blocks of solid rock, which fit perfectly without any mortar. Particularly noteworthy is the large curved western wall, due to its shape and elegant regular masonry. 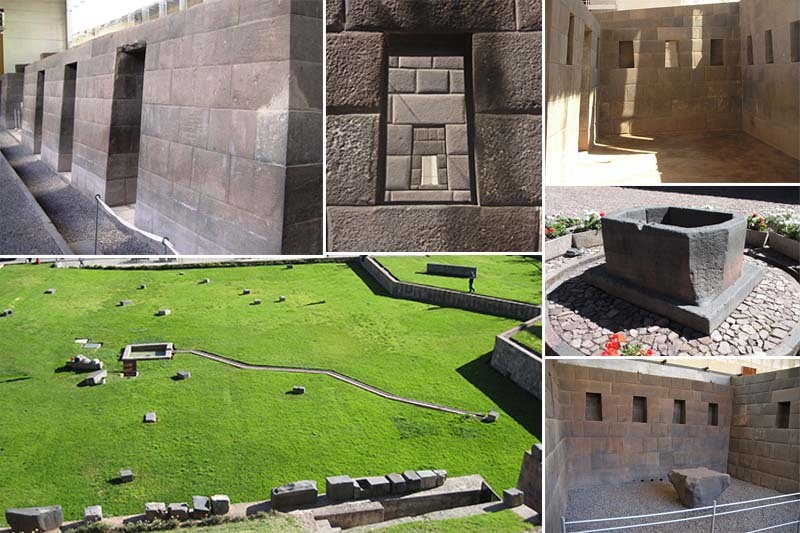 Most of the walls were built slightly inclined inward, a typical feature of the Inca architecture. It has trapezoidal access doors and windows that allow the entrance of light, it is known that most of the walls were covered by a wide band of gold located at half height. The interior buildings had a thatched roof and are only one floor. The doors were also covered with gold, in the same way, the exterior and interior of the different temples, as well as the inner face of the perimeter wall. What to see in the Coricancha? In this room was a representation of the god Huiracocha and some Inca mummies; The enclosure was sheltered by mamaconas or priestesses of the sun. It is the most important archaeological site; The mastery of the work, is reflected in the design of the enclosure. The interior of the Temple of the Sun is vertical, however on the outside the curvature on the wall is clearly visible. This temple like many other Inca constructions does not present any material in the joints of the stone blocks that form its walls, and there is practically no space between block and block of stone; It is as if they could have molded the stones at will. In this temple were worshiped the stars, servants of the moon, daughters of the sun and the moon. The Incas believed that the stars were placed in the sky as in simile, corresponding to all the animals of the earth; That is, it was thought that every animal that existed on earth had a like in heaven. In the middle part of the Temple of the Stars, you can see a ceremonial niche where you can see works done in low relief and bone remains of auquénidos, this hornacina is related directly to the sunrise during the winter solstice. It is called the enclosure of the rainbow, since it was thought that this came from the sun. All the walls of the room must have been completely covered with gold. According to the chroniclers, in a gold foil on the wall was the arc of the sky painted with its seven colors. Adjacent to the enclosure of the rainbow, there is a large space whose specific function has not yet been deciphered. In the middle of this enclosure there is a lithic element in the form of a table, brought from the sacred garden, which is why this room is known as a place of sacrifice. At the bottom of the wall there are three well-worked holes that served as drainage. Source of the colonial era constructed by hand, that fulfilled the function of water deposit, of octagonal form and quadrangular base; Some chroniclers affirm that it is of Inca origin, and that it was poured chicha, as an offering for the sun god (inti). The last of the rooms whose access has three doors, was destined to the cult of thunder, lightning and the ray, which they called inti illapa. And he worshiped, offering him ritual sacrifices. At the bottom of this gallery is “the temple of the moon”, in the middle is the door or sacred alley, and further down is the temple of the stars. The moon besides being considered like sister and woman of the sun, received its divinity of Huiracocha, making it patron saint of the women’s birth and queen of the sky. The moon was a female deity, and thus its representation was sculpted. Their veneration was in charge of the women. Beautiful Inca passage that led to the most important area of the Coricancha. Presents lithic blocks. Three lithic blocks with more than 30 angles stand out. One of them magnificently shows twenty-four angles and six sides. Also impressive is the inverted form that shows the end of the passage. In the lower part you can see the sacred gardens, in the time of the Incas, these gardens were decorated with elements of the flora and fauna of the Tahuantinsuyo empire, as well as multiple works in gold and silver. You can see one of the fountains in the sacred garden. During the festival of the Sun, the people conquered by the Incas, made a pilgrimage to the city of Cusco (capital of the empire), bringing offerings of gold and silver, and ceramics that were received in these gardens.